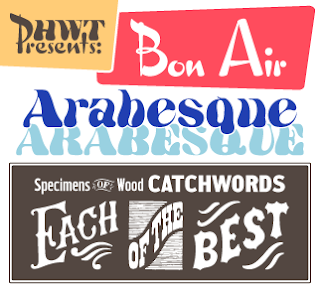 Arabesque and Bon Air, two alphabets from two different centuries, are not what most people immediately think of when they think "wood type". These quirky script fonts simulate hand lettering from very different eras and are now brought into the digital age for the first time ever. A third font, Catchwords, brings a classic printshop resource into the digital designer's toolbox. For an indepth look at these titles, including background information, source images, character previews and more, visit the Hamilton Wood Type Foundry website. Special introductory offer: Purchase these 3 new HWT releases for only $49.95 (reg price, $24.95 per style). This offer is good through March 31, 2013. Check out the HWT Combo Pack, here.